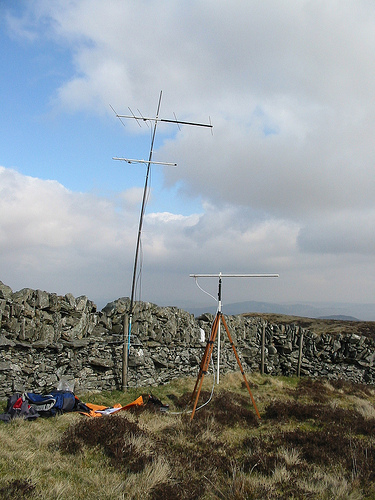 LRS Chairman John GM8OTI had a go at the RSGB 50 MHz UK Activity Contest on Tuesday evening, 22nd March. 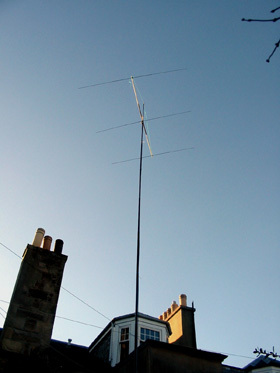 He says that his home QTH is not good (in south Edinburgh, RF noise all around, and the Pentland Hills to the south) but he got his 3-element homebrew yagi up at 12m on a Spiderbeam pole. His station is a Yaesu FT-817 with a homebrew 50W linear, all running on batteries (normally he operates /P). 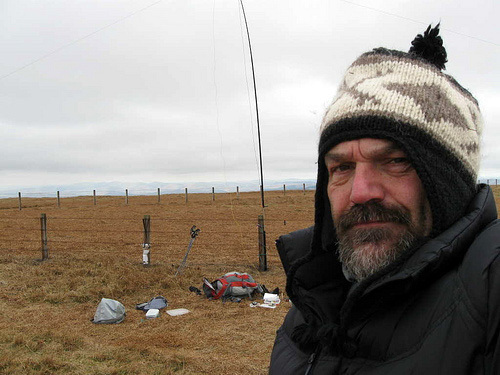 Not much luck though - three contacts north of the border (best DX was GM4JTJ at 89km, but that was not difficult), and a non-completed QSO with GM4JR in the south of Scotland. One G station was heard (just) working GM4JTJ but could not be raised. The log has been submitted anyway - it gets a few points for the club! John will be out operating /P over the summer from hilltops where he hopes to do better! 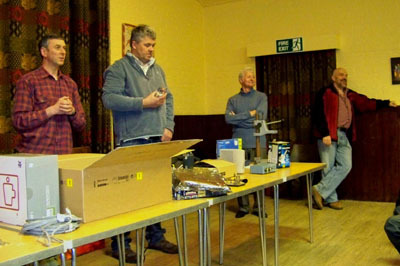 The Lothians Spring Junk Sale was held on Wednesday, April 13th at St Fillans Church Hall. L-R: Norrie GM1CNH auctions as Colin GM4HWO, Jack GM1CQC and Andy GM7HUD watch. Many visitors from other clubs joined LRS members to pick up bargains, including a strong contingent from the Livingston club. A selection of photographs can be viewed in Meeting Reports. 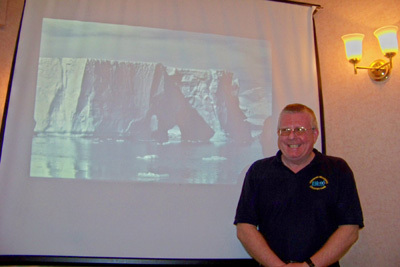 At the LRS meeting on 23rd March 2010 Dave Burke GM6SZJ talked about "Operating VP8AQA from Faraday Base, Antarctica" and showed many slides of his three years there. Dave was electrician / boatman at Faraday Base from 1981 till 1984 with the British Antarctic Survey. 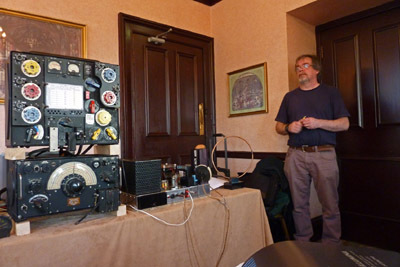 He also doubled up as relief radio operator (presumably when not working the DX on the ham bands)! A full report with photographs is posted in Meeting Reports. 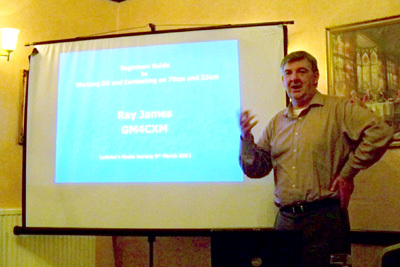 Ray James GM4CXM from Bearsden presented a very interesting and comprehensive talk, "A Beginner's Guide to DXing & Contesting on 23cm & 70cm" on 9th March. 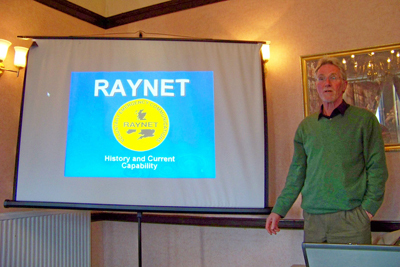 Ray's talk provided an overview of radio equipment, feeders, antennas and the use of modern web-based attributes in order to maximize your results. Propagation modes including aircraft reflection, meteor scatter and moonbounce were covered as well as operating hints and tips. 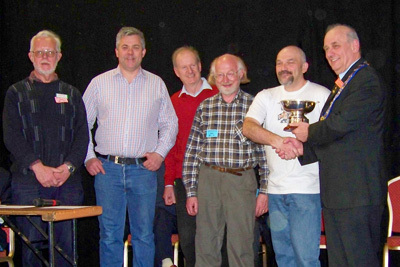 A full report with photographs and many useful web links is available in Meeting Reports.